What does eleven mean? One more than ten and yet, in 2018, it means in one year so much can happen. Does one year make a difference? I think it can. The collective of many “ones” seems to be the spirit of Utah and the Idle Free movement. It began with one person talking with another about the pollution that they could see, taste, feel and smell. The questions grew from one to many, ”what is this black smoke we are seeing coming out of tailpipes?”, and “If it is burning my nose, lungs and eyes, what does that mean long-term for my health and the health of our children’s developing bodies?” The questions kept coming and the Idle Free movement grew out of the biggest question, “Why Idle?” The question was asked in one fifth-grade classroom in Holladay, and responded to by one teacher, Patti White. Her students asked why the school buses were idling at neighborhood stops and schools zones? They wanted an answer. And a solution. This small question led to the action of countless others: big and small players, loud and quiet movements, one and many, again and again. Our collective voices were heard. Notably, Utah Clean Cities and the Utah State Board of Education provided the training to ensure school bus drivers were trained across the state to “Turn the Key and Be Idle Free”. And they are, every year. The school bus drivers are some of the biggest advocates, after all, they too are breathing the fumes along with their precious passengers. Sharing the air at school loading zones are students, crossing guards, faculty and staff, and the people in the idling cars; all breathing the same air. They are all within the HOT zones of pollution. To this problem, our resolute and imperturbable Utahns, used warm tones (and sometimes HOT ones) offering solutions, and even demanding them, for the protection of themselves and loved ones at home, school and at work. Utah businesses are an unsung hero of the Idle Free movement, advocating for clean air and reducing costly, senseless wasted fuel and engine wear. Utah Clean Cities has dozens of partners who proudly use the Idle Free driver training, signage and display the little round logo, TURN THE KEY, BE IDLE FREE message on their refuse haulers, company cars, work trucks, buses, vans and heavy-duty equipment. You can see them in drive-up windows, on doors and in parking lots throughout the state. The collective of one: one teacher, one student, one mayor, one citizen, one school, one business, one city, and ultimately the one person who turns the key, is what makes this a remarkable grass-root program. 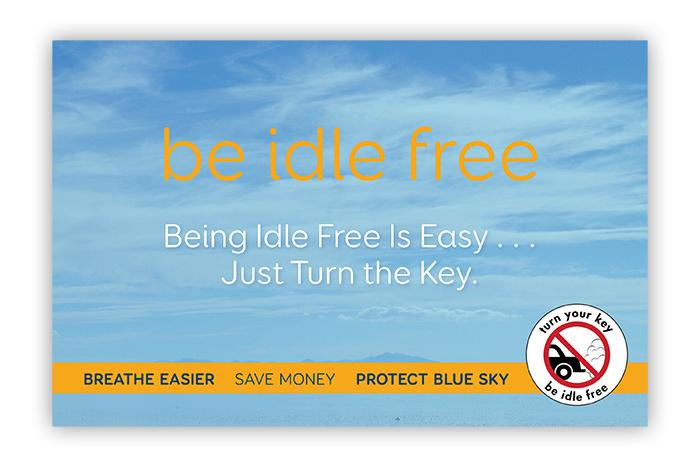 Turn the Key, Be Idle Free has become uniquely Utah’s motto for the environment and clean air. It has become the movement that belongs to the one individual—the one who has awareness, who cares, and can take individual responsibility. We can all be Idle Free. 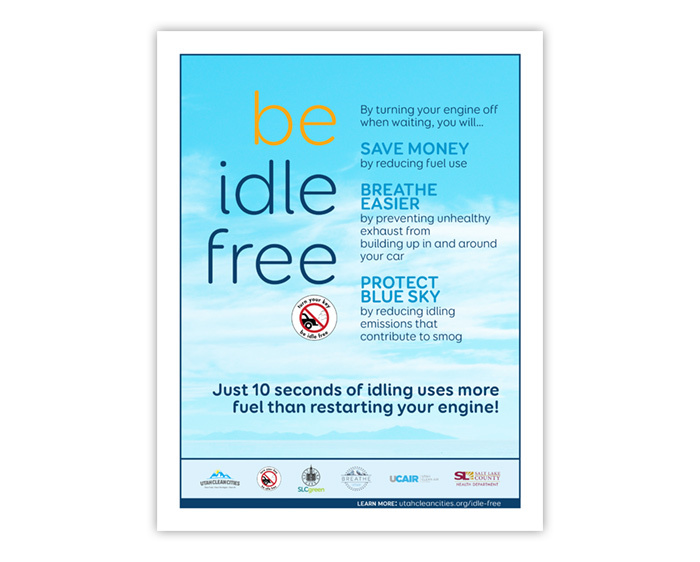 The fast turning of time has led to late summer and to the realization that the 11th Declaration for Idle Free Month and Idle Free Season is here again. I reflected on last year and the great celebration of last year’s milestone 10 Year anniversary event. Many people — ordinary folks and extraordinary leaders –I like to say “from Alta to Zion and everywhere across the state” gathered at the Captiol to celebrate the success of Idle Free. This year, we decided for the 11th Declaration, we wanted to set a new goal for 70 Mayors (we had 50). Utah leadership responded, and in less than a month of reaching out to Utah mayors for renewed support of the declaration, we surpassed our goal by one… just one more than seventy! This year the support from Utah cities has grown to a historic high with seventy-one Mayors signing, along with Governor Gary Herbert, in support of Idle Free Awareness Month and Idle Free Utah 2018-2019. This is highly significant. Those seventy-one mayors represent the majority of Utah’s population, roughly 76%, and further, all seventeen mayors representing cities in Salt Lake County, along with Mayor Ben McAdams, have signed the Governor’s 2018-2019 Idle Free Declaration. On September 18th, Utah Clean Cities is celebrating the work of our dedicated partners: the “ones” and the many, the large and the small. 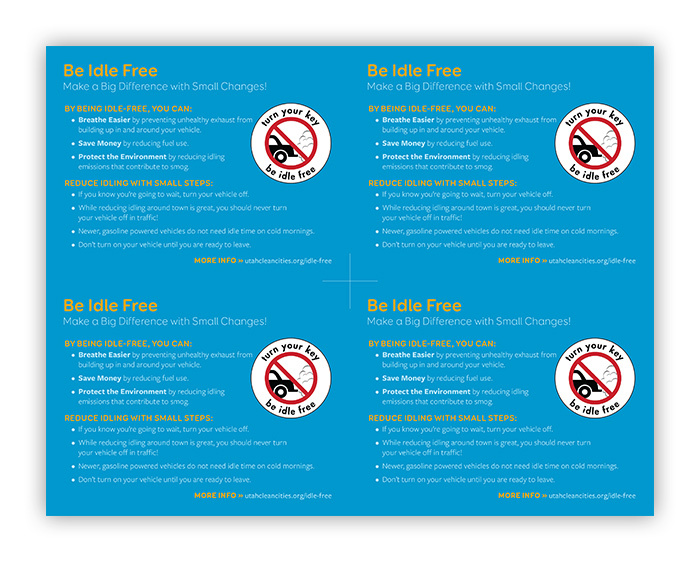 We are proud to announce that eight Utah cities are Idle Free cities complete with Idle Free ordinances and laws supporting local efforts to ensure communities have support with idle free education, signage, and ultimately enforcement if needed. It’s all the right steps, one at a time, in the right direction. This movement is important and we challenge every single city and town in Utah, one and all, to join in with the leadership and positive movement for Turn the Key, Be Idle Free. Breathe Easier, Save Money and Protect Blue Sky. 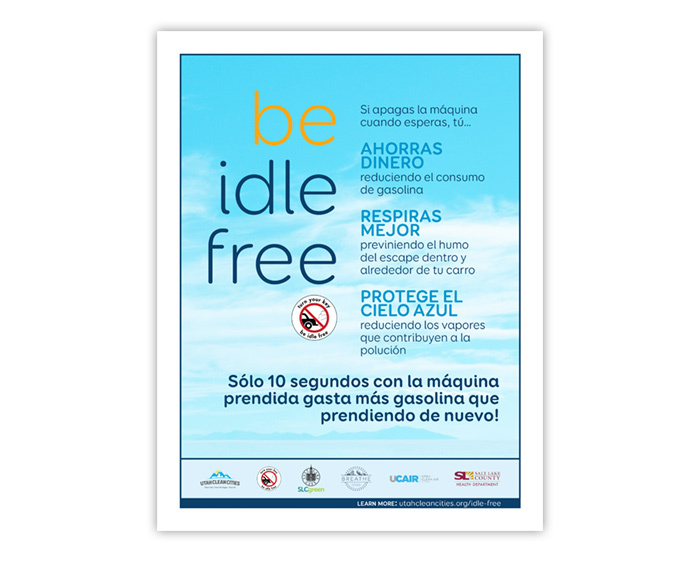 Please contact us to become an Idle Free City. Contact Ashley Miller who diligently works with cities with the help of Breathe Utah and Utah Clean Cities. Tammie Bostick-Cooper is on her third year with Utah Clean Cities. She inherited the wonderful grass-roots program from her vigilant predecessors within Utah Clean Cities and the many partners who have been “the growth” of the program since the start more than 11 years ago. She remains in awe of the one-plus-one-equals-three (1+1=3) concept and marvels at the fact that this year it equals eleven! Despite her poor math, she remains, as her children call her, “the Idle-nista!” She is humbled by all the Ones that made this Utah’s own- TURN YOUR KEY, BE IDLE FREE! Our newsletters are full of information about funding opportunities, alternative fuels and relevant events and more! We generally send 1-2 emails per month. 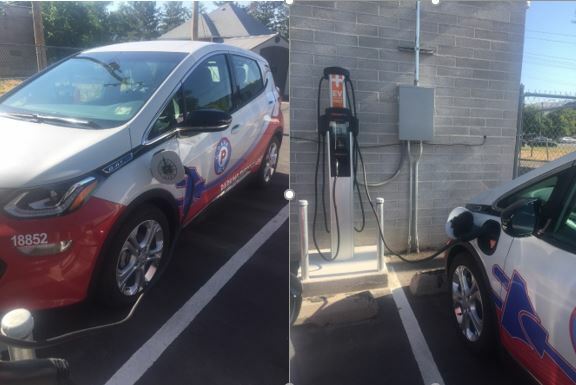 SLC Parking Enforcement Electrifies Fleet! Saves 90% on Energy Costs. The Salt Lake City Compliance Division has a colorful, new addition to their Parking Enforcement fleet. Four all-electric Chevrolet Bolts have replaced old JEEP Wranglers to deliver financial savings and notable pollution reductions. Greg acknowledged there was initially some skepticism among staff that the new EVs would prove viable as fleet vehicles. That skepticism has been replaced by enthusiasm as the electric cars are now “the preferred choice” for most employees. Compliance has been able to seamlessly integrate these vehicles without any modifications to routes or other significant operational changes. Even with 90 degree-plus heat throughout July, and the A/C running for most of the day, the 200-plus mile range of the Bolts has allowed officers to complete their daily routes with energy to spare. In addition to stylish looks and a fun driving experience, the EVs are also delivering serious operational savings. Low-speed travel and frequent stopping led to fuel consumption averaging around 10 MPG for JEEP Wranglers in the fleet. Compare this to a Chevy Bolt which averages around 119 MPG-equivalent according to FuelEconomy.gov. Use in actual operations for Compliance shows the vehicles are averaging around 3 miles per kilowatt-hour of electricity consumed through three months. This equates to an energy cost of 3 cents per mile for the EVs (assumes 9.0 cents / kWh) compared to 30 cents per mile for the Wranglers (assumes $3.00 / gallon) – an energy cost savings of 90%! For a vehicle traveling 12,000 miles per year, energy cost savings like these add up to over $3,000 annually and quickly pay back any initial cost premium. The new electric cars are also expected to have far fewer maintenance costs than their gasoline counterparts. The Compliance Division will be able to track and quantify actual savings over time, but reports published by organizations like AAA suggest EVs have the lowest maintenance and repair costs of any vehicle type. While low operating costs are attractive, these new vehicles arguably deliver their most important benefits when it comes to pollution reductions and air quality improvements. The Southwest Energy Efficiency Project (SWEEP) published an evaluation in 2017 of EVs operating along the Wasatch Front in Utah that demonstrated up to a 99% reduction in local air quality pollutants relative to a new gasoline vehicle. The SWEEP research also documented a carbon emissions benefit of 19% for EVs in Utah, but analysis of the Compliance Division fleet suggests an even bigger savings for their operations. Based on the energy consumption averages mentioned above, Salt Lake City expects the Chevy Bolts will reduce carbon emissions 72% on a mile-per-mile basis relative to the JEEP Wranglers. This is certainly a step in the right direction for the City and its Climate Positive community goals. 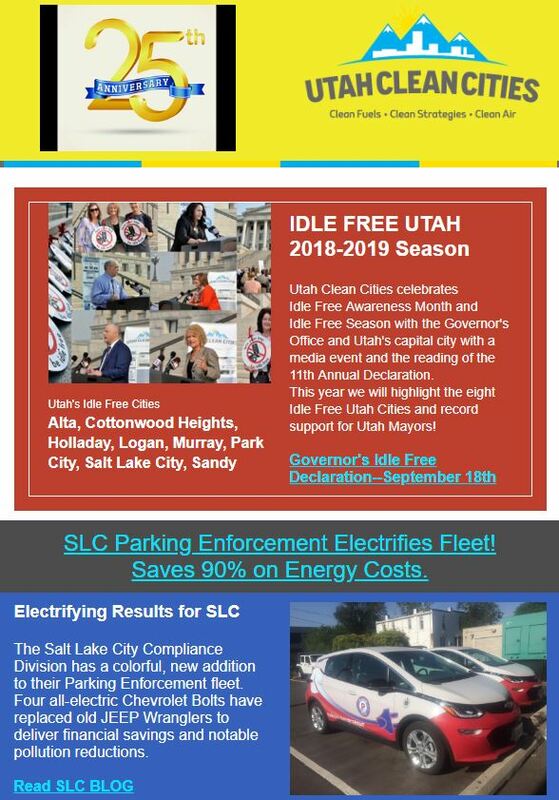 http://utahcleancities.org/wp-content/uploads/2018/08/SLC-BOLT.jpg 1073 1430 Tammie Cooper http://utahcleancities.org/wp-content/uploads/2017/04/UCC_logo_web.png Tammie Cooper2018-08-07 01:00:422018-08-07 01:00:42SLC Parking Enforcement Electrifies Fleet! Saves 90% on Energy Costs.